I heart Compass Box. They make such neat drinks. Orangerie is exactly what it says on the tin. In fact, the tin goes into further detail: "Orangerie is a whisky infusion made of smooth, sweet Scotch whisky infused with the hand-peeled zest of Navalino oranges and subtle accents of Indonesian cassia bark and Sri Lankan cloves." 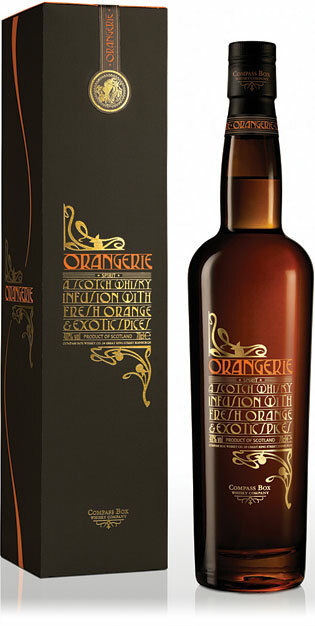 It comes as no surprise, then, what this eccentric little experiment of a dram tastes like. The orange hits me like a punch in the mouth, at first...but then I realize that it's actually pretty subtle, and that this John Glaser fellow hasn't ruined the perfectly lovely whiskey at all. It's still scotch, sweet and a bit spicy. Cinnamon? Check. Clove? Check. Like I said, it's right there on the tin. Orangerie is warming, and leaves with a nice finish - a pleasant after-image of malty, orangey goodness. I suspect the orange makes it more accessible to those who aren't so enamored with whiskey, but I'm not sure how much so. I wouldn't even quite call it a "liqueur," though a cursory Google search reveals that others disagree. It really is just an "infusion"; it's not a cocktail, drowning that bad nasty not-at-all-neutral spirit with sugar and bubbles and fruit juice. And we're all the better for it.